Extracted from the bark of a tree native to Argentina and Brazil called the taheebo tree, pau d’arco bark does not develop fungus growth. Containing the chemical lapachol, it nourishes the immune system and the circulatory system. 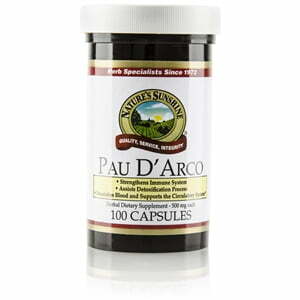 Nature’s Sunshine’s Pau D’Arco, imported from Brazil, comes in many forms, including teas, liquid extracts, lotion, and capsules. Each pau d’arco capsule is 500 mg.